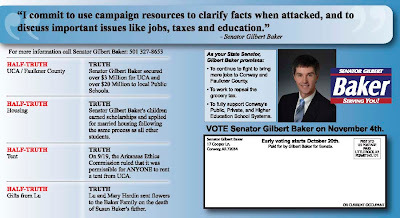 Thanks to David Kinkade over at The Arkansas Project, we have the mailer that Sen. Gilbert Baker sent out in response to the attacks from his opponent Joe White. Hey Kinkade, thanks for letting us read your mail! ...And Sen. Gilbert Baker's Response. The exclusive camera of "The Tolbert Report"
Views and opinions expressed by this blog are independent of any political party or candidate. The author is a conservative pro-life activist but does not represent or speak for any particular group. Every effort is made to report accurate and timely political news, particularly as it affects Arkansas. Please send any corrections, clarifications, or questions to me at Jason@TolbertReport.com.